Corruption exposed. 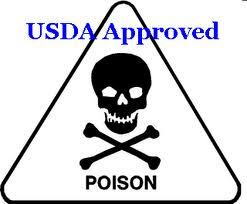 : FDA - approving poison? It's been happening for years! FDA - approving poison? It's been happening for years! Many people are becoming aware of the dangers often found in our food and drinks these days, however most still mindlessly rely on the destructive idea that the FDA would never allow us to consume anything dangerous. And that authoritative figures are 'always' looking out for our best interests. In reality, they are 'always' looking out for their own interests, as well as ways to poison us! According to natural news, a widely unknown and far more dangerous than most, artificial sweetener has been added to our food possibly since 2002, without mention on the ingredients list. It is apparently not required to mention this dangerous toxin to allow people the choice of whether to consume poison or not, according to the FDA's logic. Here is the original article: Neotame. Neotame has not actually been properly tested and yet has still been approved by the FDA. This is not surprising though, the FDA constantly approve dangerous chemicals such as Fluoride, Aspartame, Sorbitol, Saccharin and sucrose/sucralose. There are probably many dangerous chemicals added to our food and water supply that we are unaware of, and therefore cannot avoid. And how many people bother to check what ingredients are in the food and drinks they daily consume? I seriously doubt that many people do, most probably just check the calories! Not many people are aware of the fact that they're being poisoned. We are far too willing to trust the supermarkets that produce our food and drinks. We believe that the FDA would never allow us to be poisoned. And that the government are looking out for our countries best interests. We even believe that doctors, dentists and pharmacies are trustworthy and there to look after our health. Many people even fall for the lie that when the police commit their evil invasions of privacy and attack people for attempt to exercise their right to freedom, are 'just doing their job'. But why do we fall for this nonsense? Why do we so willingly leave our fate in the hands of an authority figure? Quite simply, schools train us to do so! The education system, actually an indoctrination system, trains us to respond to a bell - this bell dictates when our lessons start, when we have our break, when we get to eat, when our day is done etc. And the authority figures dictate what we learn and how we behave. We are conditioned to accept this authority. And so from a young age we are bombarded with authority from strangers, which leads us to rest our fate in strangers all our lives. The only authority any child should ever answer to is a parents! Schools do not exist to educate, they exist to shape our opinions and adult behaviour. And they succeed in just that. There is no greater cruelty than training intelligent humans to be stupid and mindlessly follow a dangerous and corrupt leader. Just as there is no greater cruelty and torture than to train intelligent humans to respond to the sound of a bell or the time on a clock! Slave mentality is enforced from birth, but still it goes unnoticed. We readily accept it. And we ensure that our children are also destroyed by it! The state makes it clear that it owns you. But many people choose to ignore this. And indulge themselves in escapism so that they may remain in ignorant bliss. But even the most ignorant of people will begin to feel how things are changing. The depression is hitting everyone as we begin to struggle to survive. Hopefully more people will cease to rely on an authority figure to dictate their lives. Do not rest your health and fate in the hands of a corrupt establishment!